2005 Aprilia Caponord Rally Raid. Picture credits - Aprilia. Submit more pictures. AN OUT OF ORDINARY MOTORCYCLE. Style and technology, comfort and adventure, touring and enduro, the Caponord Rally Raid combines two worlds in one total extreme machine. Only the Caponord Rally Raid is capable of conveying limitless sensations and taking you wherever you dream of going. 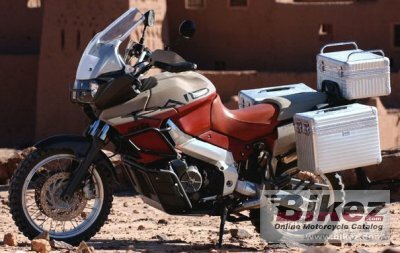 In the Rally Raid version, Aprilia�s pace setting maxi enduro is even more versatile, exciting and comfortable then ever. Fuel system: Injection. Integrated electronic engine management system. Indirect multi-point electronic injection. Lambda probe oxygen sensor in exhaust system. 47 mm diameter throttle bodies. Lubrication system: Dry sump with separate oil reservoir. Clutch: Multiple disk in oil bath with patented PPC power-assisted hydraulic control. Exhaust system: Twin stainless steel silencers, one catalyser per silencer. Frame type: Sloping parallel twin spar frame in aluminium-magnesium alloy. Front suspension: Marzocchi 50 mm hydraulic telescopic fork. Piston and cartridge motocross type fork hydraulics. Compression adjustment (on RH leg) and rebound adjustment (on LH leg). Rear suspension: Aluminium alloy swing-arm. New rising rate linkage with APS (Aprilia Progressive System). Sachs hydraulic monoshock with mechanical compression and rebound adjustment and hydraulic preload adjustment.Separate nitrogen reservoir. Comments: Alternative off-road tires available. Ask questions Join the 05 Aprilia Caponord Rally Raid discussion group or the general Aprilia discussion group. Bikez.biz has an efficient motorcycle classifieds. Ads are free. Click here to sell a used 2005 Aprilia Caponord Rally Raid or advertise any other MC for sale. You can list all 2005 Aprilia Caponord Rally Raid available and also sign up for e-mail notification when such bikes are advertised in the future. Bikez has a high number of users looking for used bikes. Before you buy this bike, you should view the list of related motorbikes Compare technical specs. Look at photos. And check out the rating of the bike's engine performance, repair costs, etc.